While your students have learned about the health consequences of tobacco use in previous grades, it is a good time to refresh their knowledge about these issues. Developmentally, your students are at a pivotal stage. It’s a time when more of them may be experimenting with tobacco, may be tobacco users, or may have friends who are. This activity is designed to remind students about some of the health consequences associated with smoking cigarettes and using smokeless tobacco. Knowing the facts and understanding the severity of the health risks may prevent students from experimenting or stop them if they already use tobacco. You might consider having the school nurse or health teacher join you for this activity. Have a dictionary or health textbook on hand so students can look up unfamiliar terms and share them with the class. You may also wish to have them refer to the Glossary included on this site. You may choose to present this activity on an interactive whiteboard or have students complete it individually or in small groups at computers. Share the digital activity link with your students and then review the information in the activity with your class. Have students take turns reading the activity material aloud and suggesting answers. Knowing this information, why do you think some people risk using tobacco? Before completing the lesson, present the “Look what tobacco will do” poster depicting some health consequences associated with tobacco use. It is included in the “Materials” section below. Read the poster with your students and ask them to comment on the facts that are presented. Emphasize to students that these are health risks tobacco users face. The best way to avoid these issues is not to use tobacco. To reinforce the seriousness of the situation, students might research stories of young people affected by tobacco use or speak to a local health care provider. Or, as a class, visit the CDC’s website for additional information on health consequences. Use the supplemental “Gamers” video, in the “Materials” section below, to complement this section. Have small groups of students research the health consequences of tobacco use and create posters of their findings to educate other students and encourage them to be tobacco free. 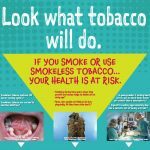 Students will find the “Look what tobacco will do” poster and the material to create their own digital posters at the Follow-Up Activity link below. Share the link with students. Consider having students create presentations to complement their posters and share with the class.